I have been covering the Big Picture in the weekend reports, and not a whole lot changed since the last weekend report really. That said, I will cover all of the market sectors that I usually do, and discuss the possibilities going forward. I expect this to me a week of increased activity (FOMC). SPX - We have a swing low at what looks to be a 1/2 cycle low on day 18. The follow through will tell us the strength of the daily cycle. The 200sma acted as support, and volume increased off of the low. 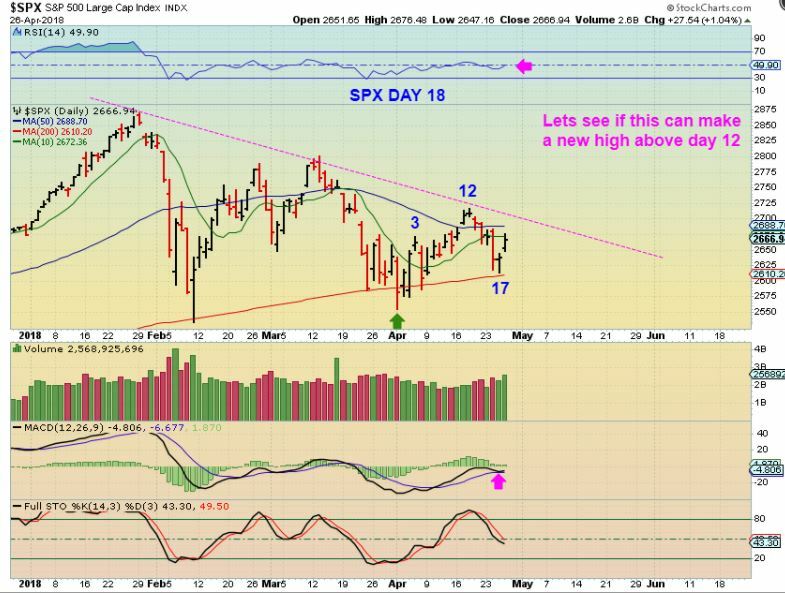 I willbe watching for a break of the down trend line & a new high above day 12. 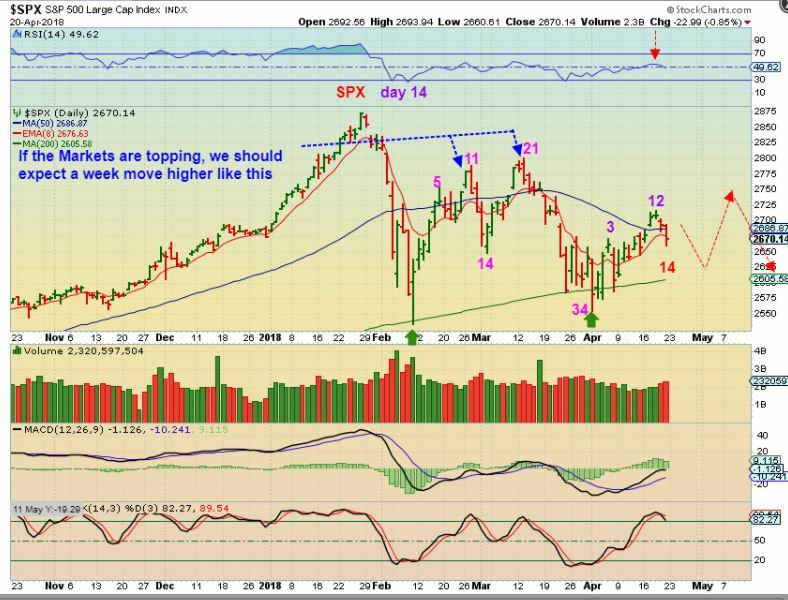 SPX APRIL 20- Last week I looked at the move out of the Feb lows and noticed a pretty drastic sell off on day 13 & 14 below the 50sma, so I drew the SPX chart with a similar drop into day 14, a bounce, and then possibly another drop. 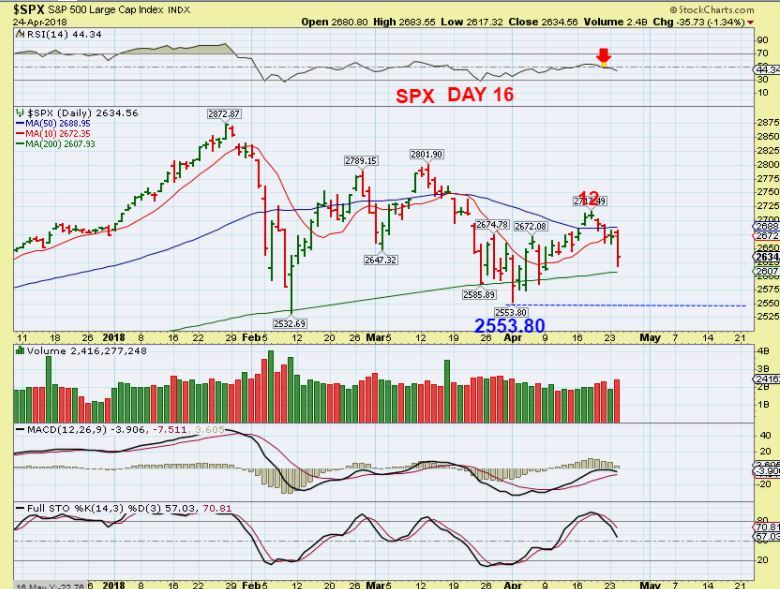 SPX - We are REALLY seeing a struggle here to gain some traction. 2553.80 IS CRITICAL in my opinion. If those lows break, this would appear to be a failed daily cycle. And in addition to that, I posted this chart in the comments section yesterday. SPX - This should be a 1/2 cycle dip, and we need to see price break higher soon. I expect that it will back toward the recent highs, and if it does, this current action could look like a shake out at the 50sma. So far, the move out of the lows has been a sideways consolidation. 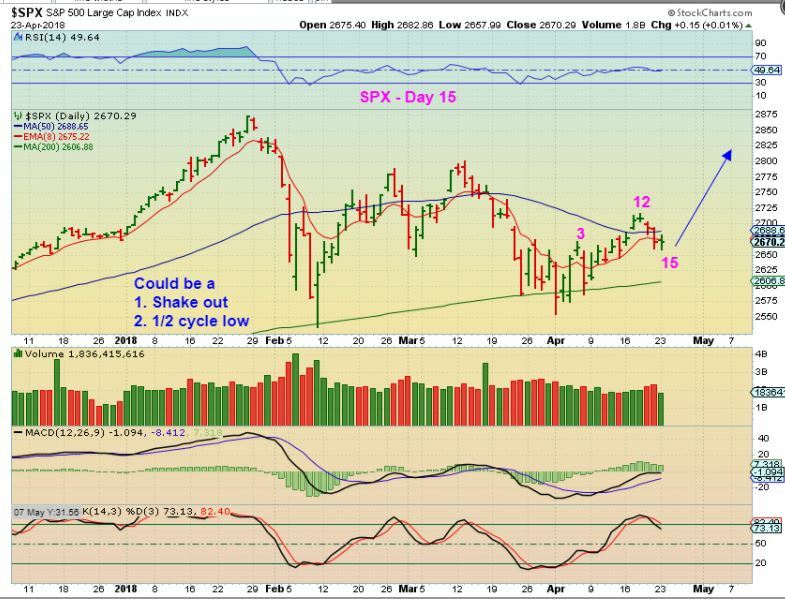 SPX DAILY - This is where the SPX stands with its cycle count. We experienced a bit of weakness at the end of last week, and you all know my Big Picture outlook. This could be playing out the way it was presented in the weekend report 3 weeks and also 2 weeks ago. On the chart I wrote week, and meant 'weak'. 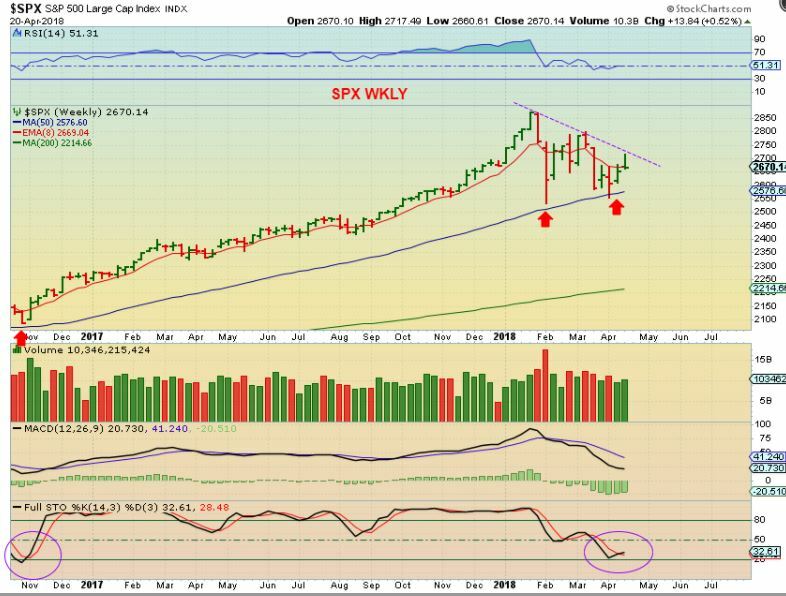 SPX WEEKLY - Nothing is wrong with the weekly chart at this point, but it was rejected temporarily at the down trend line, and I want to discuss the big picture further in this report. So far in the markets it seemed like Everything had been taking turns moving higher, right? Aa a lean Green fighting machine, we've seen Tech, Biotech, Oil & Energy, Precious metals, metals and miners all enjoying a day in the limelight. All the charts are looking great! 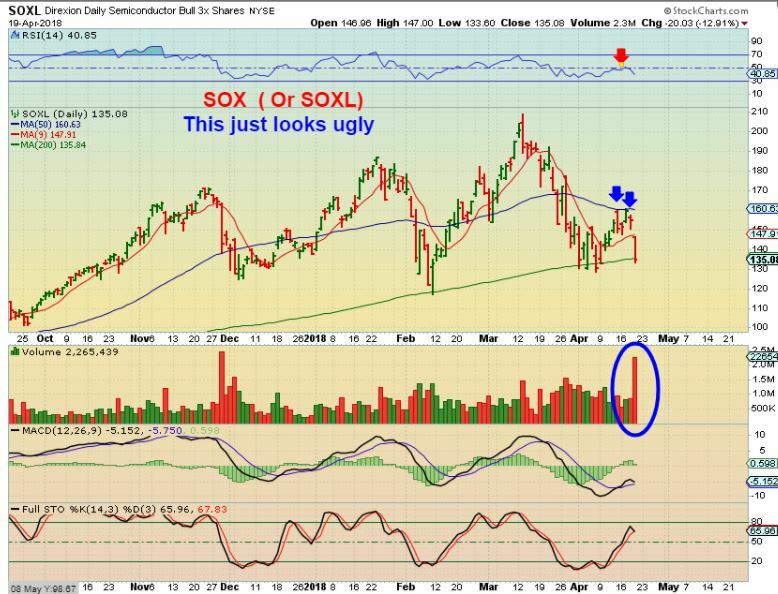 SOX ( Or SOXL) Semiconductors - Suddenly yesterday, behind the beauty cracks appeared. 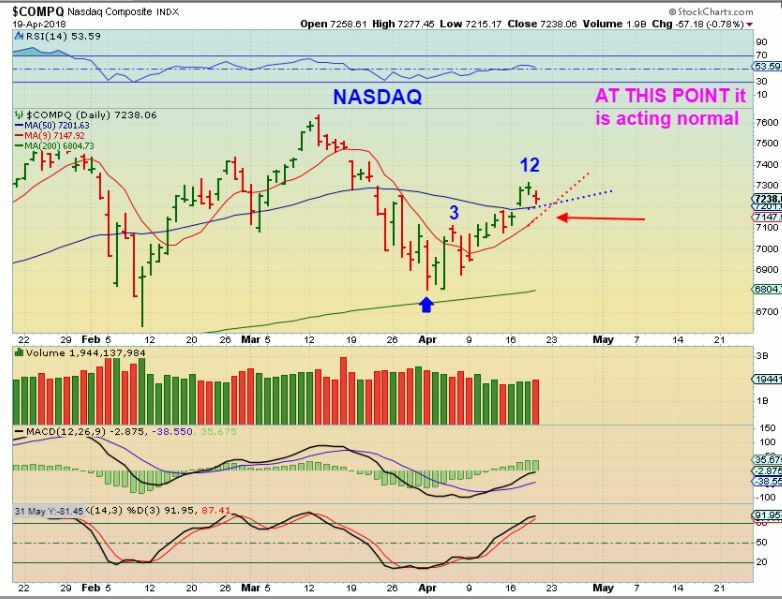 NASDAQ from yesterday - Early in the daily cycle count, I was leaning toward a bullish resolve of this battle at the lows. 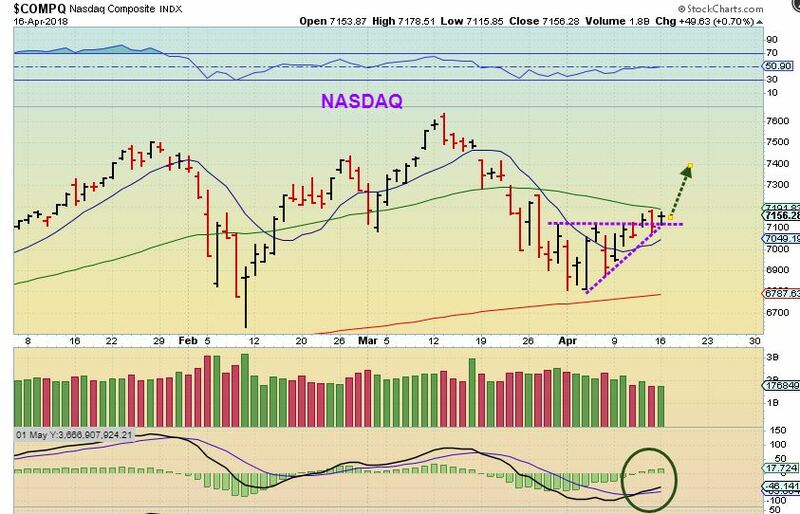 It was the most likely scenario due to cycle count and many of the stocks that I liked were holding up nicely.